it was manufactured in Clydebank Scotland in April 1951 and bears the centenary badge signifying that it was made during their 100th year of manufacturing sewing machines, these do not come available for sale very often. 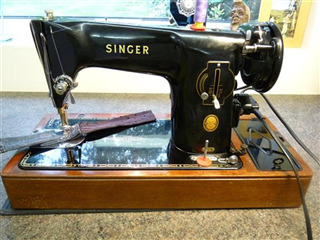 there is nothing complicated about this one - it simply sews straight stitch & reverse this machine will sew a wide range of fabrics from lightweights to leather - it will hem jeans so easily, sew canvas, leather and other heavy fabrics. It has been tested on 14 thicknesses of denim and 5mm leather and it sailed through! All paintwork is near perfect except for a very few pin mark scratches, and perfect gold decal work all around the base. The carrying box that it all fits into is also in good condition. This machine has been a much loved and prized possession which travelled abroad with its owner to far away places, perhaps she made her wedding and honeymoon clothes on it and later still her baby garments. Whatever it has been used for it was looked after with great care and is now in great condition for someone else to cherish for many years to come. This machine has been lovingly restored and serviced by my self a singer-trained mechanic; comes with accessories, foot control this machine comes with an electrical safety check. I strongly recommend to anybody wanting to purchase this type of machine, they have it electrically checked and tested. I wish you luck if you bid and happy sewing if you win.